Good evening, and welcome to the third intallment in my series of rambling and disjointed customer reviews of the work of Steve Ricks. Tonight, the brown Edwardian Frock Coat, made to the Five Coat pattern, as documented elsewhere within this blog. 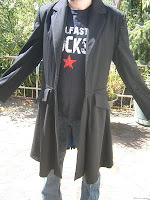 Just before I inflict my review proper onto the eyes and minds of Steve’s readers however, I feel I should preface by outlining just what an odessy my search for the perfect frock coat has been. In fact, it’s been roughly twenty-six years, if you’d count that as an odessy. 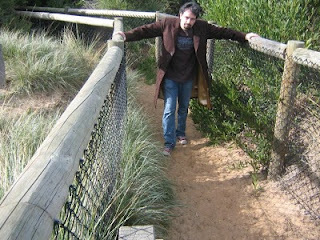 A correct, genuine, fitted frock coat of the style of the fifth Doctor is, as I discovered, a very, very elusive beast. 1984: At age 13, my frock coat fetish was already apparant, compounded by the nightly appearance on my TV of the fifth Doctor, who was wearing exactly what I was after (well, except for the piping. And all that beige.) Boy, I wanted a frock coat of that cut and length. My Mum bought me a duffle coat. Wasn't really the same thing. 1985: I got my hands on one of those mac-type coats from the op-shop. Dark blue, it was, and not, even in the eyes of the most generous observer, remotely a frock coat. But it was long. I painted light blue piping on it for some reason. With model paint. That was the end of that one. Later in 1985: I somehow aquired another men’s coat, this time a wool overcoat, again dark blue. I honed my legendary self-taught sewing skills (all by hand, the complex mysteries of the sewing machine eluded me then, as they continue to now), by changing the lapels, adding darts, adding pockets, and generally imbuing it with my own personal improvements and modifications until eventually, it was wrecked. 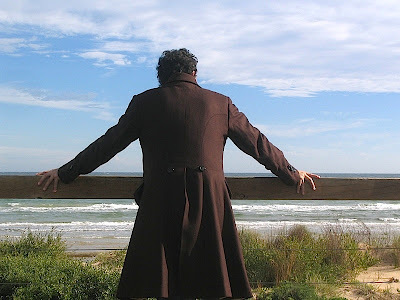 1990: I had been a stagehand at a local theatre company, and the costume maker had made some (what I thought of as) very passable frock coats, by buying an old two-piece suit, and fashioning the skirt from the trousers. I tried this twice. It didn't work. 1992: I became aquainted with a lady who was an actual seamstress, and convinced her to make me what was essentially a knee-length black jacket. I can’t express how overjoyed I was with this garment. My search was apparantly over! Tragically, I wore it on New Years’ Eve, and I handed it to a friend of mine so I could engage in some fisticuffs with a frightful cad who had besmirched me. Later, my friend claimed to have no memory of ever having seen the coat. It was lost to the vortex. 1995: By this stage, I was in posession of something I hadn't previously had. A job. One day, in a moment of madness/clarity, I decided, to hell with this. I'm going to commission a professional tailor to make me one of these, once and for all. I mean, how expensive could it possibly be? About eight weeks and a month's pay later, I had what was, in essence, a much better-made version of my lost black coat. I travelled the galaxies in that coat. It was still not an actual frock coat, merely a knee-length jacket, but for now, it would do. 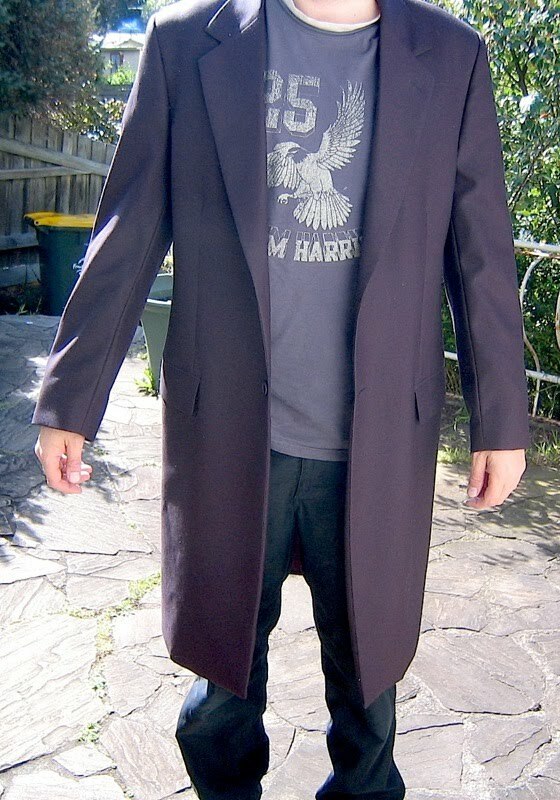 1999 (approximately): I had a go at making my own six coat. That didn't work out so well either. 2003: I don’t know why, but I commissioned that same tailor to make me a Six Coat (I’ve put this guy’s kids through college. One of them’s a gaenecologist). I don’t recommend anybody try this (at least, not until Steve finally adds it to his repetoir). It won’t work. 2005: I decided to finally design my difinitive, ultimate, once-and-for-all, no messing-around-this-time, frock bloody coat. I drafted several sketches, and assembled a number of photographs. I presented all these to my tailor, who by now was literally rubbing his hands together whenever I walked into his shop. 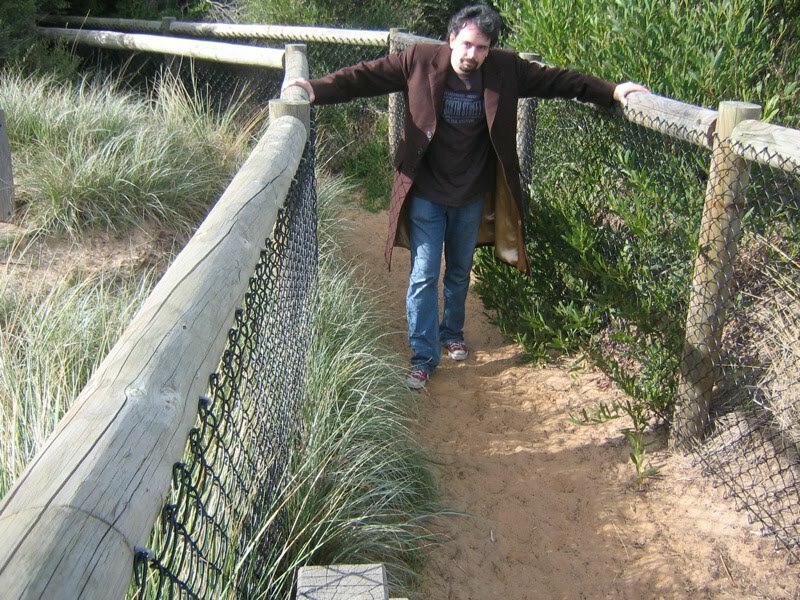 Even this coat though, fell short of what I was after, largely due to my own design. I had drawn the pockets at a rakish angle (mistake), and had made the skirt too flared (another mistake). I looked like a drunk ballerina. 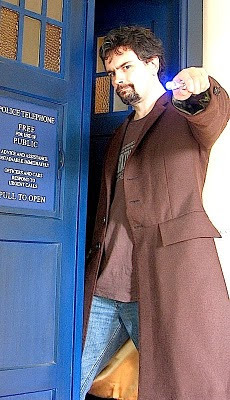 2007: I bought a genuine Edwardian frock coat from eBay. The arms were the correct length, which was a surprise given the stature of gents from those days, but it was a bit tight under the arms. To have it altered would have far eclipsed the fifty bucks it cost to buy. That one's in the wardrobe as well. 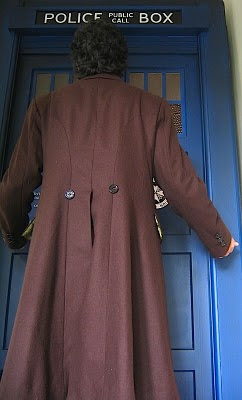 Soon I'll have to buy another wardrobe and write “frock coats” on the door. 2009: I approached a well-known online clothier to make me a fifth Doctor coat, only in brown. This is really where I learned how deceptively difficult it is to achieve the frock coat shape. I sent their versions back a couple of times to be remade, as, although they were tailored to an impeccable standard, as all their products are, the shape, cut and drape were falling seriously short of what I wanted. Eventually, they made one which, although still not what I was ultimately after, was a perfectly adequate frock coat. For anybody still reading, I had high hopes for Steve’s version for a couple of reasons. Firstly, of course, he has made me stuff before, and I think, by now, his aptitude as a tailor is beyond question. Secondly, and most importantly, he is a fan. In the past I’ve drawn sketches, supplied photographs, even given DVDs, and people still don't get it right. But a fan already knows what it is you're after, because he's been studying it for years as well. As luck would have it, Steve was already working on a pattern and a commission for the Fifth Doctor's coat. I approached him, asking whether he would be prepared to make one of a different colour scheme, and also with a bit of a free hand, regards the lining. I think he found the wider parameters of the brief a bit liberating, as rather than being a slave to screen accuracy and colour matching fifty-seven thousand beige swatches, he could just do whatever the hell he liked. My main objective was that the lining should be bright, and striking. So that people would say, “Oh yes, there’s a guy in a brown coat over there. Who care - HOLY CRAP! 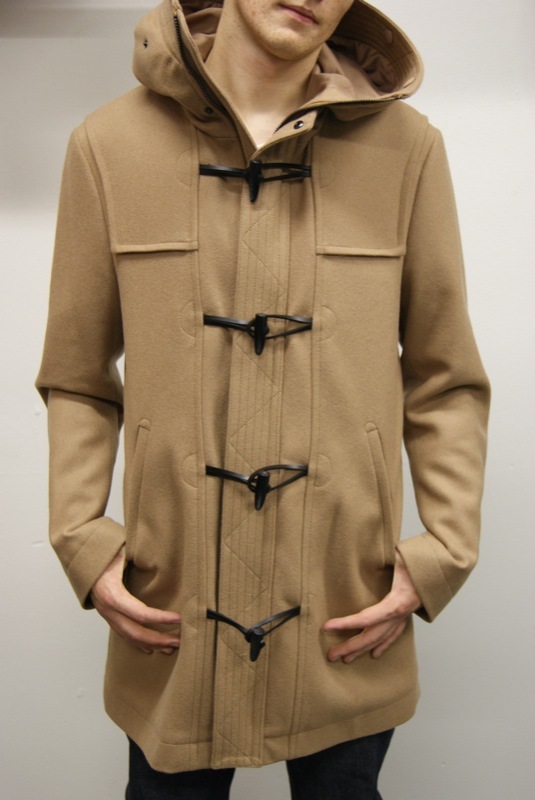 WHAT THE HELL SORT OF LINING IS THAT FOR A BROWN COAT? ?” I mean, who hasn’t started screaming insanely when they've spotted somebody with a funny lining? I know I have, it’s perfectly normal. Anyway, I should probably touch upon the point of the review for at least a second: the Coat. I should begin with the above-mentioned lining, for it's here Steve really let his tailoring hair down. One day, I emailed him to ask how it was going, and to enquire as to whether he’d found a lining option to show me. He replied, saying that he’d just been working on the lining, and had gone just a little bit mental with it. Adding, ominously, that I would either love it or hate it. The juxtaposition I intended has certainly been achieved, albeit via a slightly different route, as the outside of the coat is is roughly-textured, heavy brown wool. I wanted a fabric that didn’t seem immediately pristine or formal, and Steve sent me several swatches to choose from (I should also mention here that along with the various swatches, he also included some actual pockets which he’d made to show me how they’d eventually look. I still have them, although I have no idea what to do with them). Admittedly, when I first opened that long-awaited FedEx box, I was struck by how heavy the fabric was, and was initially concerned that it may appear more of an overcoat than a frock coat. However, I’ve been flourishing about in it quite a bit, and that's not the case. It’s around the same weight as tweed. Steve and I locked horns (no pun intended. Alright, pun intended) over the buttons. I had initially specified simple tortoiseshell or horn buttons, in keeping with the inconspicuous outer shell which houses this shocking elegance inside. Steve, however, came up with some ornate gold Italian metal buttons with a beautiful and intricate design, which I felt were a little too fancy for what I had in mind. And so, the battle of Accomplished Tailor versus Artless Primate began, and eventually Steve aquiessed. It must have been like removing an elegant spiral candle from a wedding cake and putting a hammer on there in it’s place to Steve, but, in his never-ending quest to satisfy the infuriating customer, he sought out some genuine horn buttons, at no small cost to himself. He still prefers the metal ones, though. And so, finally, I have a frock coat I am happy with. And it only took twenty-six years. Slightly longer than it took to read this review. Luckily, you don't have to wait that long, however. To my knowledge, there is nobody out there who can compete with this guy in terms of quality and accuracy. If there is, I'd certainly like to see it. I hate to conclude this review on such an obvious note, but I feel there's no more appropriate way than to paraphrase the opening title sequence of the A-team. yeah, so give a link to where we can find him? Baker's Doctor Who ruined me ;-). To this day, I've still a penchant for scarves (resonably sized ones), brogues and frock coats. What style! ...ah, enough about me, I adore your coat!